According to Trip Advisor®, Barcelona is the 5th best world destination for tourists to visit in the year of 2013. It is definitely one of the most beautiful cities of Europe. Barcelona is so full of things to do and see and one trip is simply not enough to visit all of the treasures this location has to offer. For a summer vacation or holiday, Barcelona provides everything one could wish for. A location full of culture, history, fantastic architecture of several styles, fantastic museums, world famous structures from Gaudi, awe-inspiring churches and cathedrals, parks of all sorts, the breathtaking landscape of Catalonia which surrounds the city and a fabulous beach. The image of Barcelona above was taken from the cable car on the way to Montjuic, a mountain of Barcelona. You can see the Columbus Statue at the center front, the cathedral (La Seu) in the middle and the monumental spires of the Sagrada Familia Cathedral in the distance. When one pictures Barcelona, this famous church is with no doubt the first image that comes to mind. This is the “Sagrada Familia” or the Church of the Sacred Family. Its high pinnacles dominate the skyline of the city. This famous structure is the lifetime work of the famous architect Antonio Gaudi, who from 1883 until his death through an accident in 1926 took over the planning and building of this church. The facade around the church is unlike any other church you have seen before. The ornate details are so fascinating and combine nature with religion. As a tourist, you should bring lots of time with you if you wish to see the inside of the church. The lines to get in can get so long that you will be waiting up to 2 hours. It is recommended to go in the morning hours during the summer. The line is then on the shady side of the church which will make a difference when the outdoor temperatures are over 30° Celcius. The price to visit the basilica itself for a single person was in the year 2013 13.50 Euros. You can also choose to pay for the entrance and elevator to a higher level for 18 Euros. These entrance fees help finance the building of the church, by the way. Don’t let the construction site all around the church frustrate you. 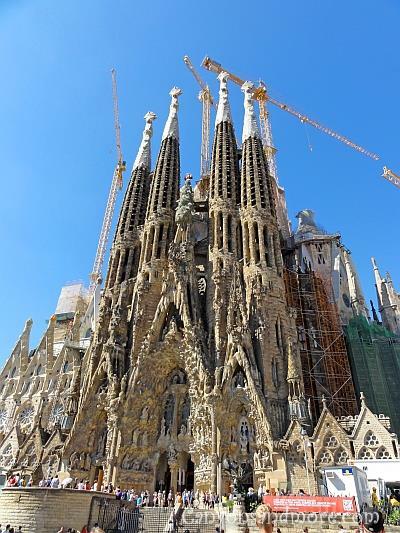 It will be first finished in the year 2026 and until then, many more fascinating details will be added to the exterior and interior of the church. Not only is the exterior of the church monumental, but the interior will awe-inspire you. It is so light and airy. The columns supporting the church are suppose to look like trees to give you a feeling that you are in nature. The windows are slowly being filled with color which add a special feeling to the room. You will find information boards all around the church which are in numerical order. On these boards, you can read about how the church is designed and what Gaudi intended to achieve with the different features. 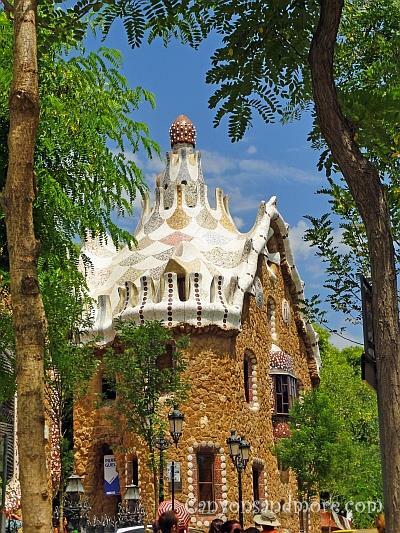 Park Güell is a popular attraction of the city of Barcelona and does not cost a cent to see. Antonio Gaudi created a treasure with this park and is a treat for the eyes of young and old alike. 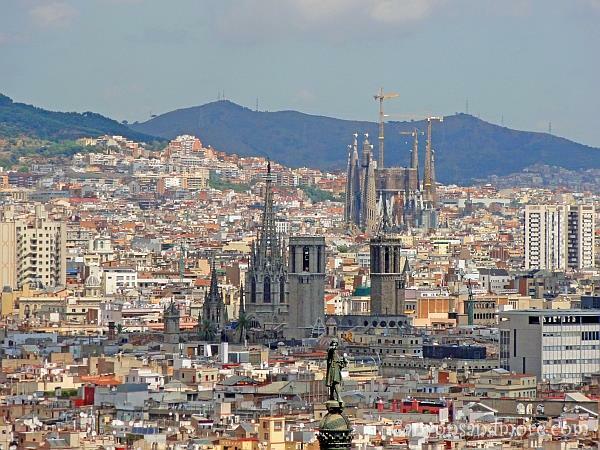 Located on a hill over the city, you can also see Barcelona at a distance and from above. There is a walkway throughout the park and if you first walk all the way up and work your way down, you will see all of the highlights this recreation area has to offer. This is one of the fairy tale houses located at the entrance. Each are extraordinary and worth seeing. The one structure is a museum and the other is a shop where you can buy souvenirs. Park Güell is impressive with its structures covered with mosaic such as the dragon at the entrance or the park banks located in the central area of the park. The Cathedral de la Santa Creu i Santa Eulália is located in the middle of Gothic Quarter of the city. If you wish to enter the cathedral, there are strict rules about your clothing. Please do not wear shorts and you are not allowed to bear your shoulders. If you are wearing a sleeveless top, then bring a cape or shoulder wrap with you. Inside the church, a most impressive Gothic style architecture can be seen. The stained-glass windows are beautiful. There is a center court area with greenery and trees where geese are being held and the area is well lit from the outdoors. 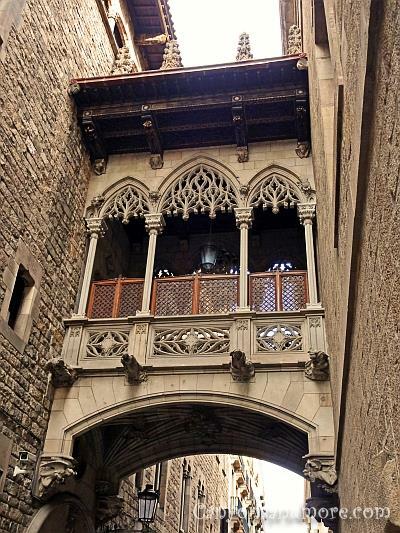 Around the La Seu Cathedral you will feel like you are being returned to a time centuries ago. Take you time to walk around the cathedral and enjoy the architecture of the area. This passageway was one of the many sights of the area. Along the way, musicians or opera singers try to earn a few Euros by adding music to the atmosphere. Some of them are really talented and their songs echo through the narrow alleys. 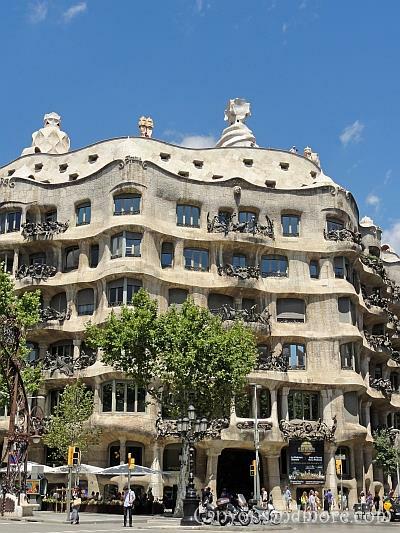 Casa Milà is a piece of architecht from Antonio Gaudi that is truly amazing and a popular tourist attraction. It is chiseled out of stone and its wavy design is one of a kind. The Casa Milà is the last work of Gaudi before he dedicated his full time to the building of the Sagrada Familia. The structure is in the district of Eixample which is also worth walking through. There is an attractive boulevard leading from the Casa Milà towards the Placa de Catalunya called the Passeig de Gràcia which has shops on both sides and outdoor cafes and tapas bars down the middle way. It is similar to the famous shopping boulevard “La Rambla” but lacking the overcrowded touristy feeling to it. On a warm summer’s day it is an enjoyable way to spend an afternoon. 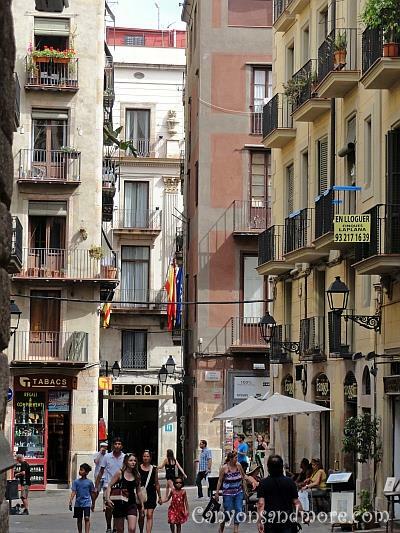 At the northeast corner of La Rambla (the main shopping street of the city) you will find Gothic Quarter area. It is an area of the city that should not be missed as it is so charming to walk through the narrow and tight alleys and get a historical feeling of the city. This area was the beginning of this city’s history and got its start as the Roman village “Bacino”. This area includes historical buildings dating back to the 14th and 15th centuries as well as many local and one of a kind shopping boutiques. Tall buildings with little balconies give the area a quaint look and small churches and sunny spaces invite you to sit down for a while and enjoy the view. The buildings in the image have upper floor apartments for the residents of the city and the bottom floors are the actual shops. The area is shady in the hot summer which is a good way to keep cool while enjoying the city as well. 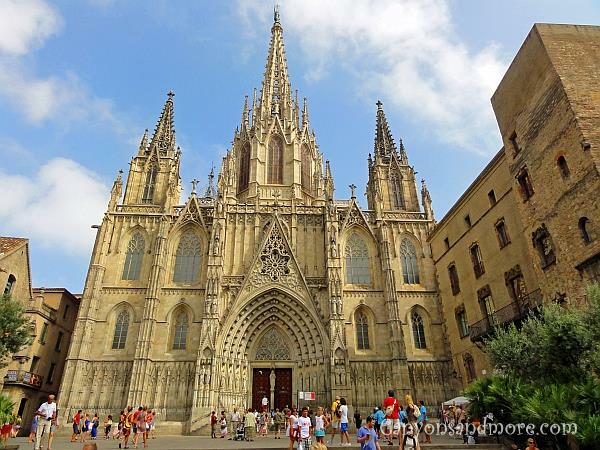 If you continue through the area, you can also visit the La Seu, a beautiful cathedral of the city. This is probably the most fantastic way to start your day. The “Mercat de la Boqueria” or Boqueria Market Hall is an attraction in itself. 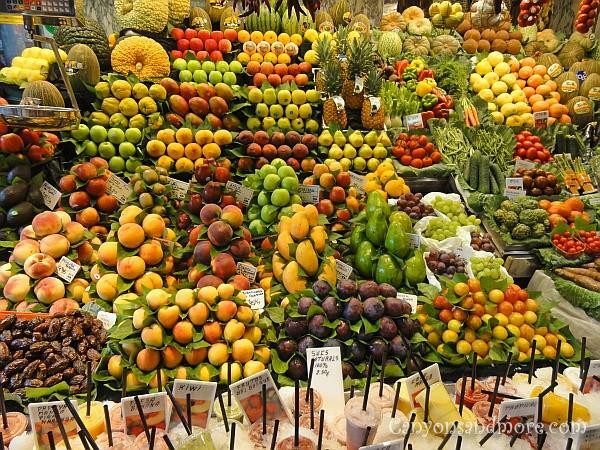 Row after row of stands present fresh fruits, vegetables, nuts, herbs and spices, seafood and meat. The stands are artistically set up and the sense of color and aroma fill the air. At several stands you can purchase cups of fresh cut exotic fruit and coconut for breakfast which are displayed in a tub of ice to keep them fresh and cold. Local residents frequent the market as well as restaraunt owners looking for the freshest and best food for their locations. 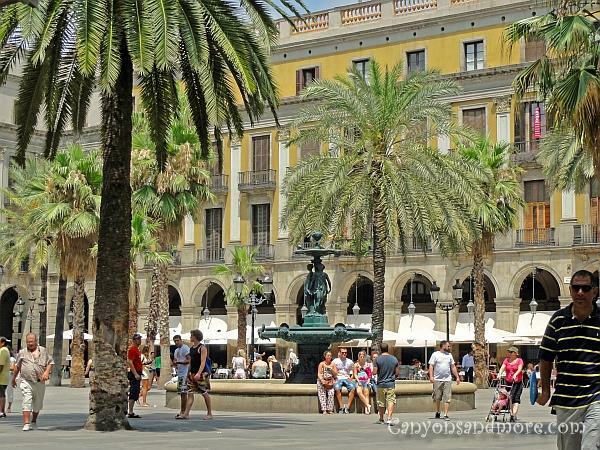 The Plaça Reial is located off of La Rambla and is a lovely location to spend a couple of hours on a warm afternoon or evening. Restaraunts, tapas bars and cafes can be found all under the arches. During the evening hours of the summer, it is not easy to find a place to sit at this popular area. It is a great area to meet up with friends or to just to sit with your loved one at a cafe and dring sangria and enjoy a few tapas. 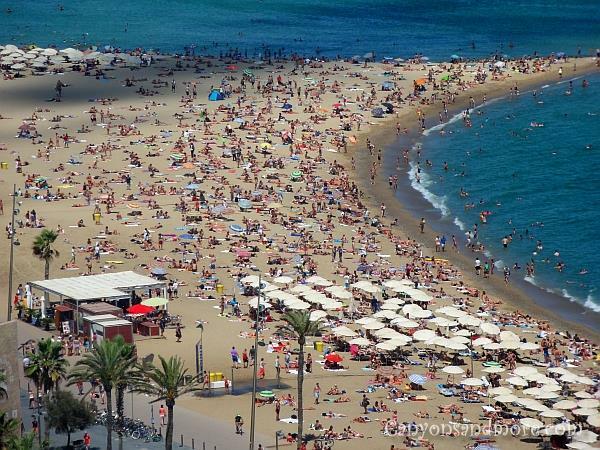 The beach makes Barcelona a perfect location to visit during the summer. You simply have the best of both worlds - a world class city and a beach to enjoy the feeling of summer.